Kale, a member of the Brassica family. They will all readily cross with one another so must be isolated. They are biennial, being sown and grown one year to flower and seed the next. Flowers are perfect and cross-pollinating. 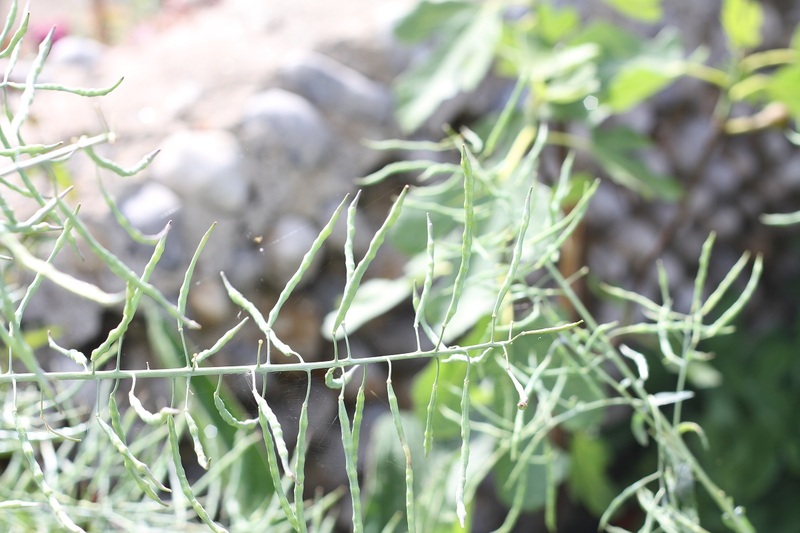 They are mainly insect pollinated. Suzanne Ashworth advises growing a minimum of 12 plants to ensure good stronng healthy seeds. Other advice includes roguing out plants that don’t conform to type, but generally plant and grow as you would for eating. Once the winter is over, the plants will start to push out flowers. Flowering starts as the days lengthen quite early in the year. This is the time to start caging, if necessary. 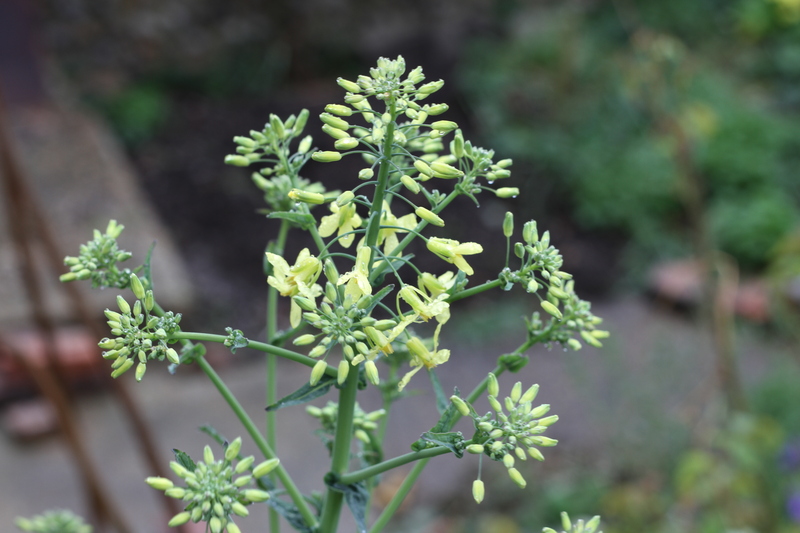 I didn’t need to do this as I only grew one variety and there were no other Brassica’s in flower nearby . out of the pods into a paper sack every few days as they ripen to maximise seed production. 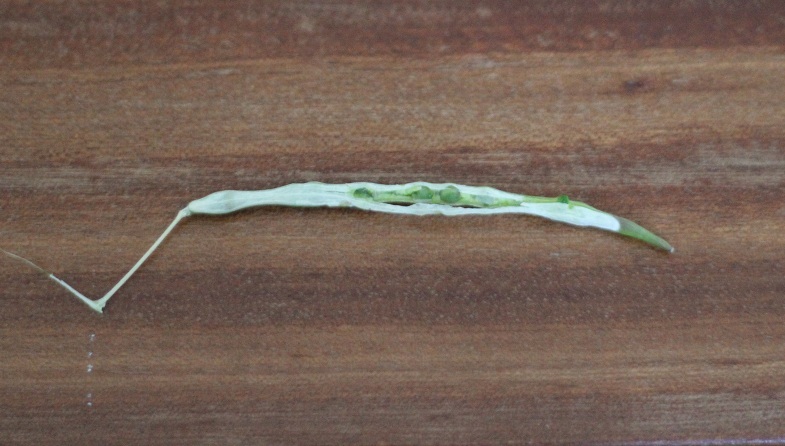 Otherwise, remove the entire stalk when the majority of the pods have ripened and dried, but not shattered. 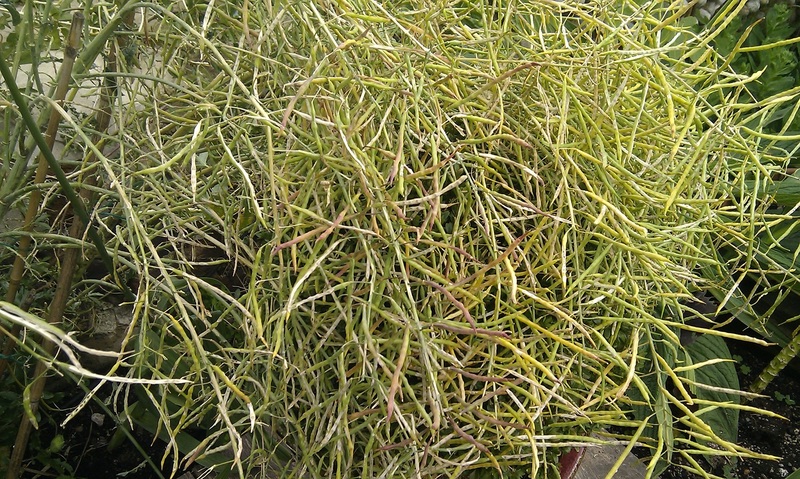 It is important not to cut the seed stalks too early, while the pods are still green, as the seed will not continue to develop once cut. Cleaning refers to the removal of chaff and debris, leaving only seed. Cleaned seed keeps better. 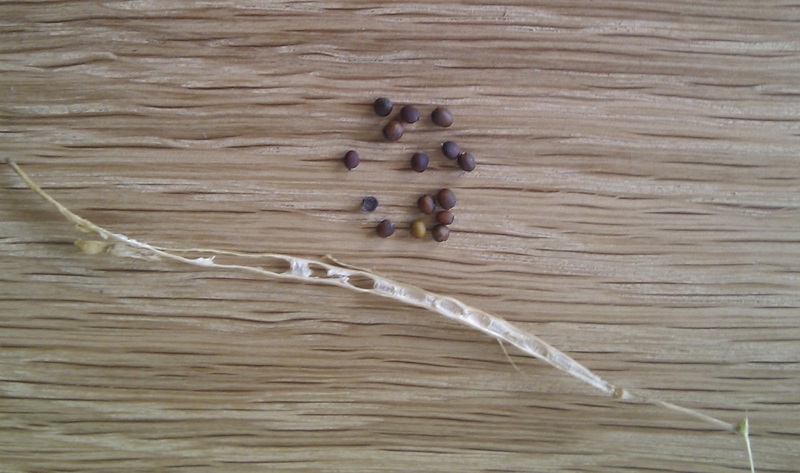 Seed should be fully dry for threshing and most of it will shatter from the pods of its own accord. 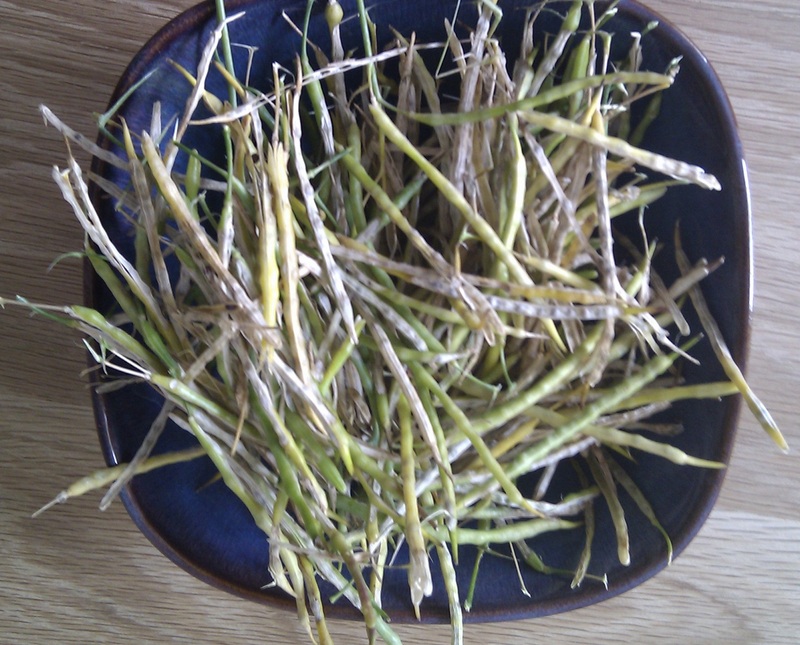 The remainder can be broken out by hand or by beating the pods in the sack and winnowing. Winnowing is best done outside in a stiff breeze. Pour the seeds steadily from one container to another, allowing the wind to blow the chaff away. Repeat until the chaff is gone and you are left with only seed. Do this over a tarpaulin, in case a sudden gust upsets the container and spills the seed. 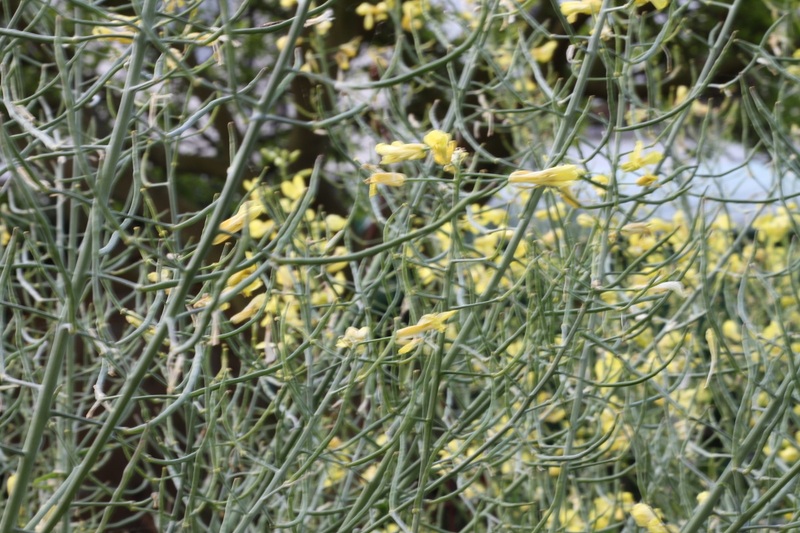 Stored cool and dry, all brassica seed will last for at least five years, giving full germination. I really hope to save more seeds this year. This is a great post!